The early 20th century was the heyday of theater in boston. Over 20 theaters offered a diverse range of entertainment from plays, vaudeville, burlesque, comedies and dramas to turkish dancers and “follies of the day”. The kensington is located on the site of the former gaiety theater – proclaimed as a “model of comfort” and “boston’s most modern playhouse”. The trocadero burlesquers opened at the gaiety theater on november 23, 1908 to a packed house of 1,700 with standing room only. The show was such a success, performances were held twice a day. Vaudeville had become known as the “theater of the people”. Today, the kensington is surrounded by beautifully restored, classic theaters: The boston opera house opened 84 years ago and was said to “take your breath away”. With the painstaking renovations in 2004, it still does. The paramount made its debut in 1932 and was deemed “boston’s magnificent movie palace”. After a major renovation in 2002, it became the home of thep performing arts center for emerson college. “the modern” was famous for being the first to show a “talkie”. IT won a preservation award in 2011 and is a popular boston attraction. Referred to as “the grand old lady”, the orpheum opened in 1852. She now hosts grammy award winners and some of the hottest bands in the country. For more information, please visit our exhibit at 665 washington street and marty’s way. 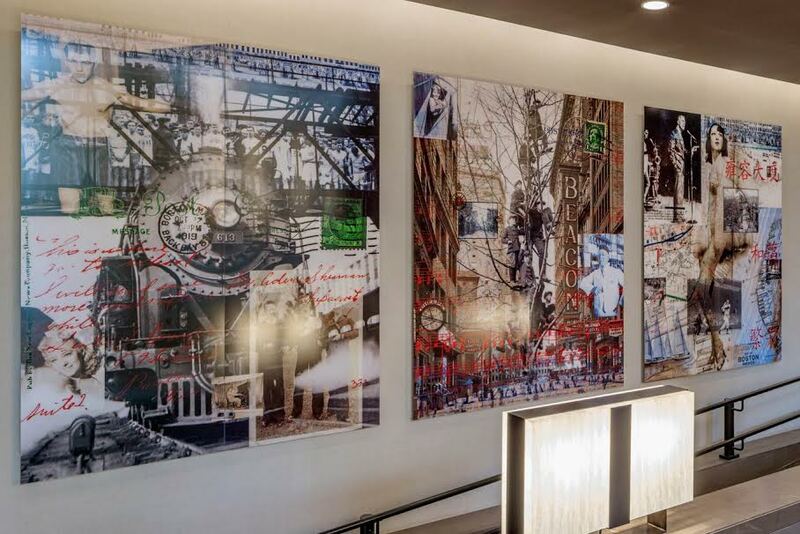 With over fifty pieces of art thoughtfully placed throughout The Kensington, residents are able to take in all mediums of artwork without ever stepping a foot out the door. The Kensington commissioned Percy for, not only his technical skill, but for the raw energy and emotion that his artwork exudes. 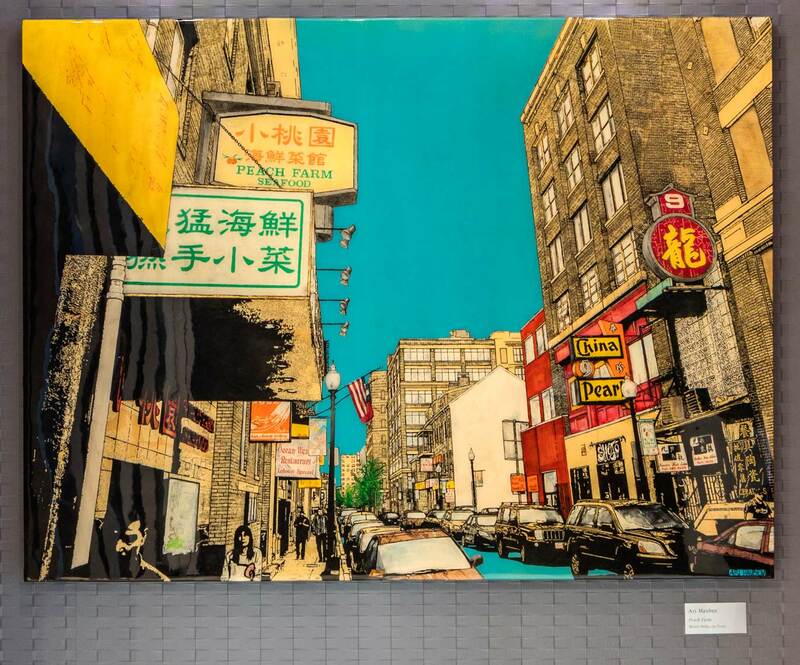 The life of the city beats within his paintings and reflects the diverse backgrounds and interested of the residents who call this building home. 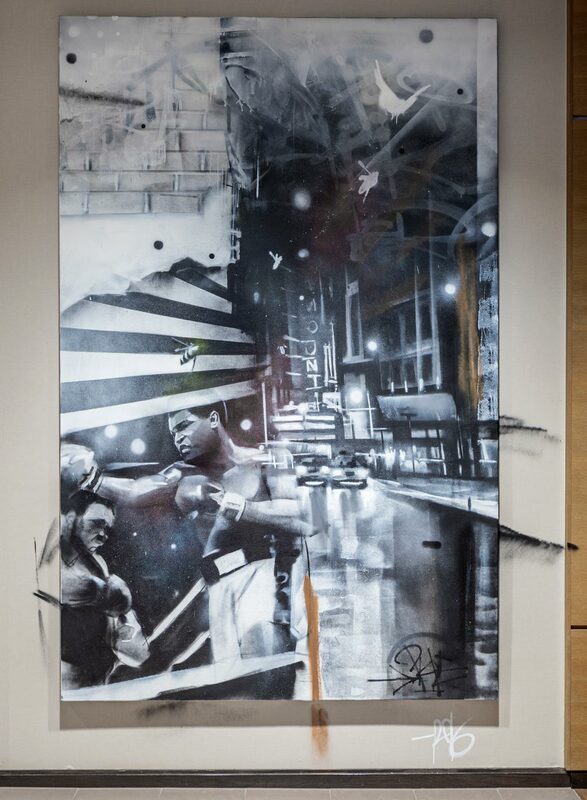 The neighborhood is depicted amid other tags regularly employed by Fortini-Wright, such as a bee, however a primary focus in this painting is Muhammad Ali. Not only a great Boxer, Ali was unwaveringly committee to peace, authenticity, and fighting for the underdog. He was known for his humor and his commitment to equality for all of mankind. There is no better figurehead for the spirit of the Kensington. 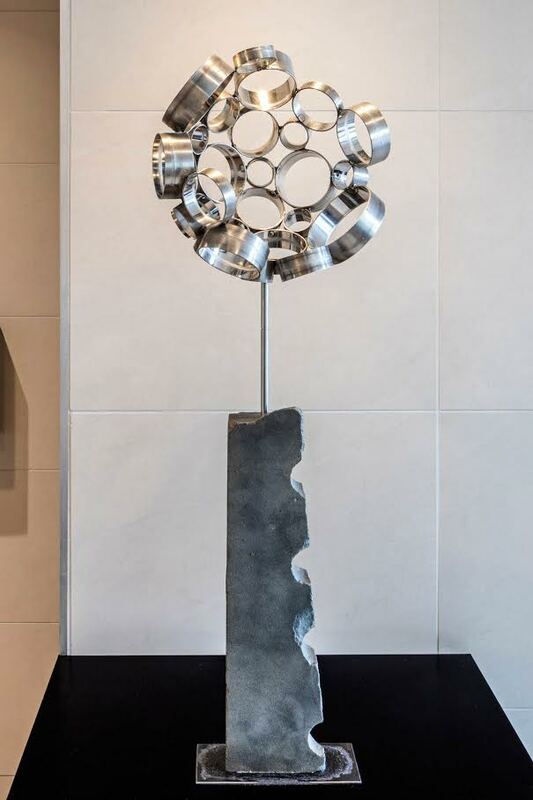 Mixed Media and Reclaimed Metals Grinbergs earned his BFA and BA (Architecture) at Rhode Island School of Design 1986 and continued his studies at SMFA and Mass Art. Now living and working in Dedham, MA with his wife and three daughters, he enjoys a seemingly endless supply of industrial scrap, found objects and rusty junk. Grinbergs has participated in countless group and solo shows throughout New England, including De Cordova Museum, Fuller Craft Museum, and Stonehill College as well as in New York, Chicago, Denver, Philadelphia, Toronto, Museum of Fine Arts, Riga, Latvia and the Embassy of Latvia in D.C. Grinbergs is a Member of New England Sculptors Association and is included in private and corporate collections throughout North America. Ari Hauben is a contemporary artist based in Boston’s Fort Point neighborhood. His work consists of multimedia works, which cover a broad spectrum of topics, styles, and materials. He is a member of the Fort Points Art Community, and his art has been shown throughout Boston, including at the Grand Opening of the Art of Americas Wing at the Museum of Fine Arts. Hauben’s style predominantly involves newspaper, epoxy, spray paint, and layering techniques that are integrated into a variety of visual platforms. Often times he constructs the images within his pieces using newspaper print from relevant articles for the dual purpose of creating meaning for the work, as well as adding an element of perspective. Stephen Sheffield, a native of the Boston area, is an alumnus of Cornell University, where he obtained a BFA in painting and photography. He received his MFA in photography from the California College of the Arts, in Oakland/San Francisco, where he was mentored by, and assistant to, Larry Sultan and Jean Finley. He currently resides in Boston, MA, and specializes in photography, mixed media and photo-montage. His photographs depict both every day and unusual events, all framed by his unique, and occasionally dark, sense of humor. His masterful storytelling, use of traditional film and non-traditional techniques including, alternative processes, mural printing, and large-scale photo assemblage combine to give his work a unique and cinematic mood. 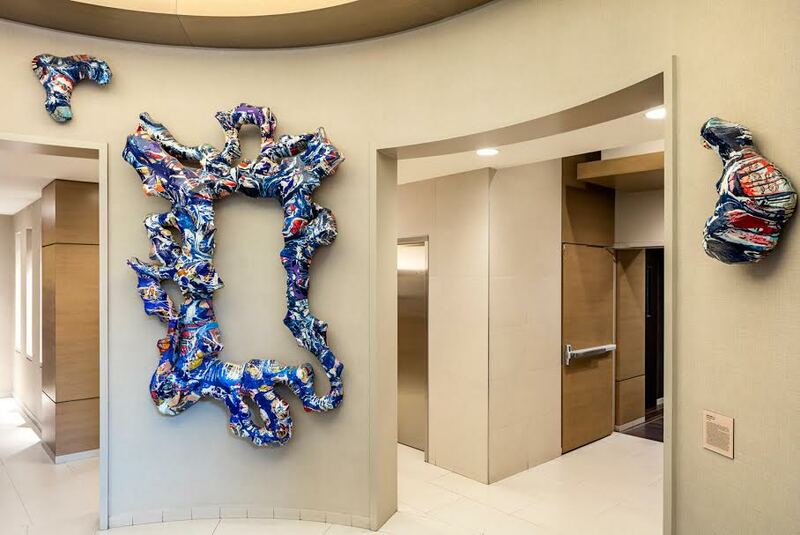 Cooper’s work champions the argument that the whole is often greater than the sum of its parts, and in that way, the wall sculpture at the Kensington, a three-piece installation, rounds out the building’s diverse collection of multi-media art. Cooper accommodated structural challenges as well as existing design elements in order to design and build a wall sculpture that was uniquely suited for the Kensington Tower’s rotunda. The sculpture is made from a three- dimensional canvas-wrapped stretcher which is then painted and finished with acrylic resin. The final sculpture is built in three parts and is mounted by way of a hanging system specially prepared and custom built for the curve of the rotunda. The undulating lines, irregular loops and bright primary palette are purposefully in conversation with not only the three monumental collages of historical photographs that line the entryway, but also the eclectic, global thematic thread that runs through the Kensington, from the fabrics to the fixtures.